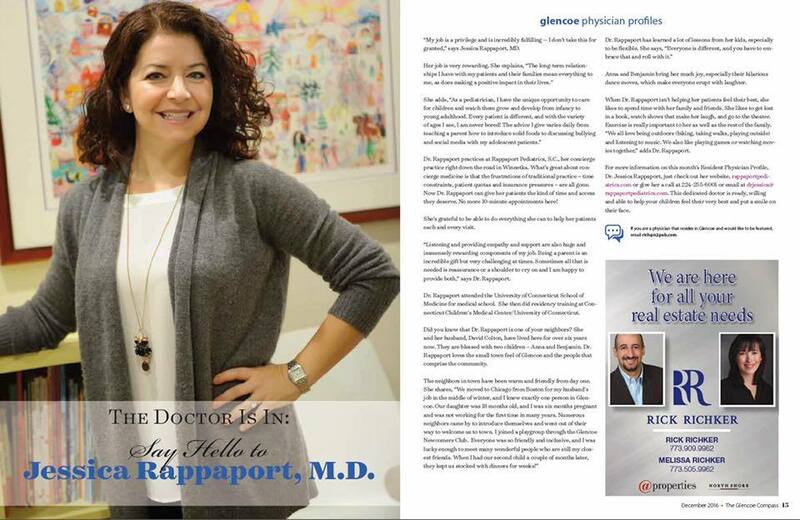 The Doctor is In: Say Hello to Jessica Rappaport, MD. Dr. Rappaport describes the rewarding experience of providing concierge care in her personalized, pediatric practice. Pediatric Concierge Medicine Practice Opens in Winnetka. One of the first personalized pediatric office practices on the North Shore, Rappaport Pediatrics reflects a growing national trend. Click to read more. Pediatric Concierge Medicine Practice Opens in Winnetka, One of the First Personalized Pediatric Office Practices in Area. Dr. Jessica Rappaport offers personalized medicine to the youngest generation…more time for patients and their parents, 24/7 access. Click to read more. Pediatrics Moves into the Concierge Medicine Spotlight: Parents and Physicians Increasingly Attracted to Personalized Care Model Click to read more.